Happy Birthday Femme Fatale of the Year Rosamund Pike! It’s Rosamund PIke’s Birthday and I would like to reward her Everything Noir’s first official..unofficial award. For 2014’s Gone Girl, Rosamund win’s Femme Fatal of the Year for her portrayal of Amy Dunne. Do you think somebody else should have won? Let me know in the comments. 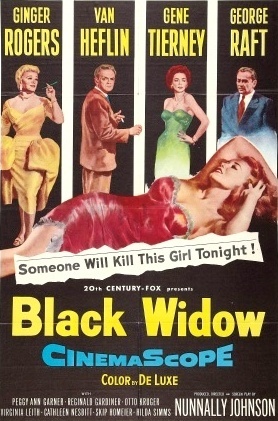 Black Widow is the first classic film-noir that I have seen that is in color. Usually film-noir from this era is in black and white and lends to the over all atmosphere of the movie. Color worked for me in this movie, the New York skyline looked amazing and felt like one of the characters. Ginger Rodgers plays a successful actress and shows why she really was a great actress in this part. Really liked Van Heflin as our main man and George Raft is always cool with his amazing voice and dialog. This currently only has a 6.8 rating on IMDb, but has only a little over 1000 ratings. I think if your a fan of the genre you will really enjoy it. If you’ve seen it comment below with what you thought of this film.